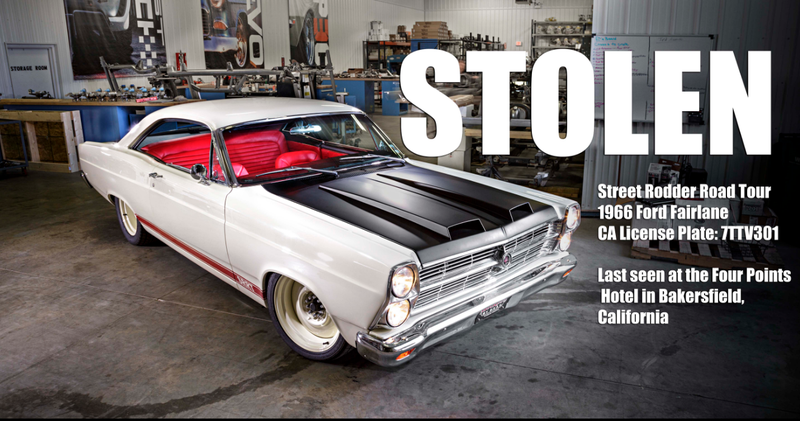 Our siblings in oil-stained hands and carbon-monoxide breath over at Street Rodder magazine need our help, because their 1966 Ford Fairlane Road Tour car was stolen a couple of days ago in Bakersfield, CA. I know first hand we may be able to help. Let’s see what we can do. The car should be pretty easy to spot, since it’s a totally custom job, with a Roadster Shop chassis, Lokar shifter, and ARP bolts throughout. The car was stolen from the parking lot of the Four Points Sheraton, 5101 California Avenue. The hotel is 2.1 miles from Stockdale Country Club and 3.5 miles from the Fox Theater in downtown Bakersfield. Whoever took this car likely knew exactly what they were doing, since the unusual shifter makes this a tricky car to start, and it’s not exactly the sort of thing you’d just part out like an Accord. If anyone has any information about the car, or, really, anything that could be helpful in any way, please call the Bakersfield Police at (661) 327-7111. If any group of gearheads can help out, it’s us Jalops. Please help me repay my karmic debt and lets find this car.